I cringed when I first heard that a digitally rendered Peanuts Movie was going to be a thing that soon existed. I saw some of the early promotional posters and the dread deepened. I figured no way would they get this right. With Charles Schulz no longer around to protect his beloved creation, there’s no telling what kind of crass cash-in this was going to be. I saw a trailer a couple of weeks ago and felt a little better. Maybe they would be able to get this right, after all. My 10-year-old daughter had interest as well (after some deliberation between this and the Goosebumps film), we checked it out his weekend and I can say that they did indeed get it right. No Celebrity Voices – The Angry Birds Movie proudly touts it’s stars from just about the first frame. Jason Sudekis! Danny McBride! Josh Gad! Bill Hader! And I have to wonder, why? I don’t think the true target (kids) for this movie really cares (or, beyond maybe Gad) or even have any real name recognition for them. Yes, I realize this is designed to hopefully draw in the parents and stoke the egos of the stars (not necessarily in that order), but ultimately it seems a little desperate. I realize this is the standard for animated movies since Tom Hanks and Tim Allen squared off over a blinking light. But there’s a big difference between the way that some studios like Pixar (the Gold standard) and say Dreamworks (not that far behind, really) operate in this arena. Craig T. Nelson and Albert Brooks being the lead voices is a far cry from Mike Myers and Jack Black. I love Finding Nemo, The Incredibles, Shrek and Kung Fu Panda – but I remember being very aware of Mike and Jack’s involvement from the get-go, not so much with the other two. And then there’s Peanuts. Not only is there not a “known-name” to be found the voice actors they found are so true to the voices we’ve all grown to know that’s it’s absolutely uncanny. There’s not a misstep in the bunch and that is no small feat. I think what they understood is that with Peanuts, the characters ARE the celebrities and that’s all you need. True to the Characters – And this dedication to character goes beyond the voices to the heart of each of the gang. They are all very much who they’ve always been. Lucy the brash, narcissist with a hint of a soft-side (and an aversion to dog germs), Sally the materialistic and idealistic dreamer. Linus, the sage giver of advice. Frieda and her naturally curly hair. Pig Pen, a proud mess. And of course Charlie Brown. The sweet, dreamer who never gets a break, yet never gives up. Digital with a Pencil Drawn Feel – the oddness of the gang living in a more rounded world (so to speak) doesn’t really linger (okay, Linus’ hair is a little strangely rendered and I did often fixate on it) and there are some great touches that keep the 2D feel intact. The bodies may be digital, but the faces are still “drawn” on and there are many moments from Charlie’s memories animated in perfect, pencil-drawn thought boxes to Snoopy’s moments under attack with classic silhouette-against-multi-colored-backgrounds, that retain the feel of the old in the world of the new. No Pandering Humor – Whether by mandate or design, the Peanuts gang remains wonderfully free of modern influences. There were no lazy texting jokes. No tablets. No sad attempts to be “current.” And best of all, no lazy bodily humor. Not fart jokes. To appreciate this restraint, all you had to do was watch the trailers that preceded the movie (Angry Birds, Norm of the North, Chipmunks’ “Road Chip,” Ratchet & Clank) which all featured at least one such moment of what is a lame, hacky writer’s crutch. The Greatest Hits – I’ve seen this listed as a negative in some reviews, but I never felt that it was lazy. Whether it’s Charlie getting his clothes knocked off on the mound, Snoopy beginning his story with “It was a dark and stormy night…,” Lucy doling out psychiatric advice for a nickel, Sally crushing on Linus, the kids rocking their famous dance moves, Joe Cool and so on. Sure it’s easy, but it’s also perfectly executed. And it really shouldn’t come as a surprise that it’s handle that way just from it being purposefully titled, The Peanuts Movie. It avoids the naming convention of so many other Peanuts specials with a Charlie-centric, “statement” title (like She’s Just Not That Into You, Charlie Brown.) because this is a true, self-titled reintroduction to the gang for new and old. Lots of Snoopy – I can possible conceded that this is more arguable than any other point since I have also seen some criticize the movie for having too much Snoopy. To that, I say, “can you have too much Snoopy?” The answer is “no” at least not when the character is some purely awesome and massively popular. Yes, the Red Baron sequence is pure padding but it’s all worth it if only for the part where he is traversing the “enemy territory” to make it back to base and you get his view and reality spliced together in escalating sight gags (him in the tub with Franklin and hand-walking the Christmas lights in front of Patty’s house the best among them). 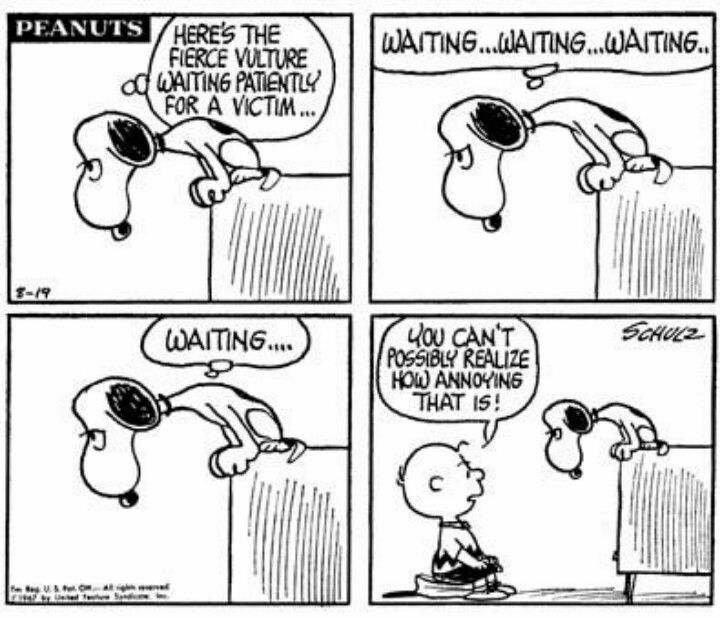 Plus, there’s Snoopy dancing, Snoop singing, Snoopy lurking in mailboxes and there’s something about Snoopy in his vulture mode that to me is never not funny. No Rerun – I was never a fan of the addition of Lucy and Linus’ little brother, Rerun Van Pelt and thankfully it appears he was deemed unnecessary. I will also praise the filmmakers for leaving out Snoopy’s brother Spike. Though there is a sight gag in reference to him and then a mercifully brief appearance at the very end in a group setting, it’s mostly blink and you’ll miss it, so I’ll count that as a win.